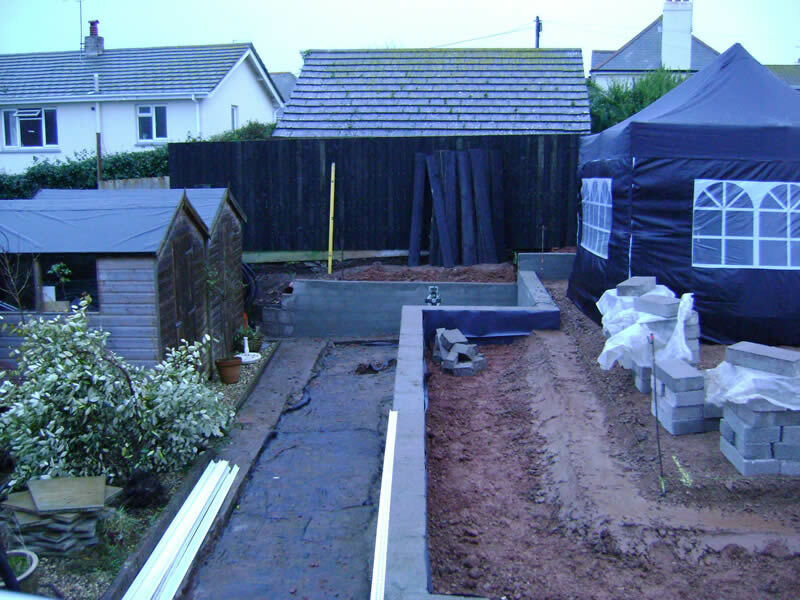 THIS PROJECT IS UNDER LANDSCAPE CONSTRUCTION, CLICK HERE TO VIEW BEFORE, DESIGN AND DAY 1 – 5 IMAGES. Saturday 01/12/12. 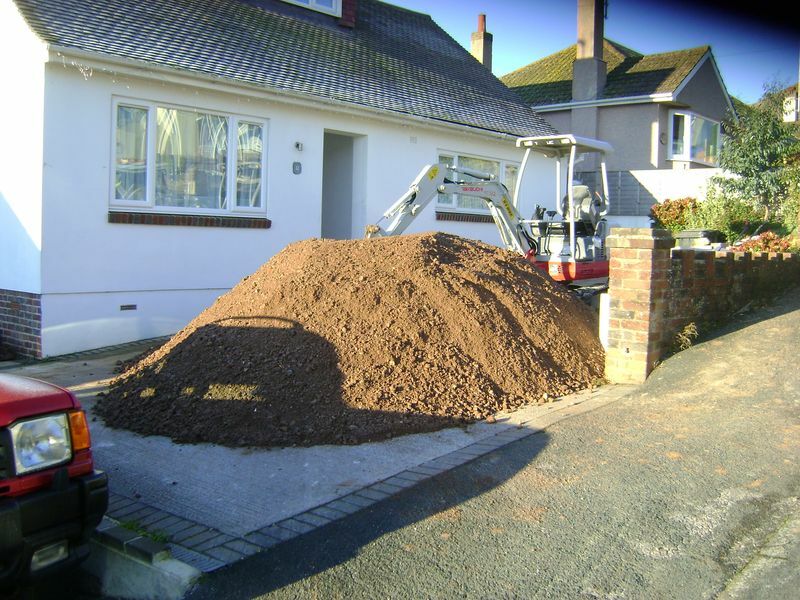 Job and knock….move 16 tons of sub base from front drive way to rear garden, rake and level at 100mm layers and consolidate….. completed by 1.30pm….home. I’m 6 tons shy of the upper 40mm to dust sub base, this will arrive first call Monday along with the 10 tons of top soil, The excavator and two power barrows are off hired late Monday after noon and will be collected. 10 tons of top soil and 6 tons of 40mm to dust sub base arrive at 8.00am, using the hired excavator to load the power barrows the top soil is installed to the dpm lined planters to the appropriate falls and levels. The 6 tons of sub base is laid, raked and leveled. The remaining electric duct is installed and taped on each end to stop debris blocking the duct. A road pin is used to hold the ducting in the correct position, bound with gaffa tape. 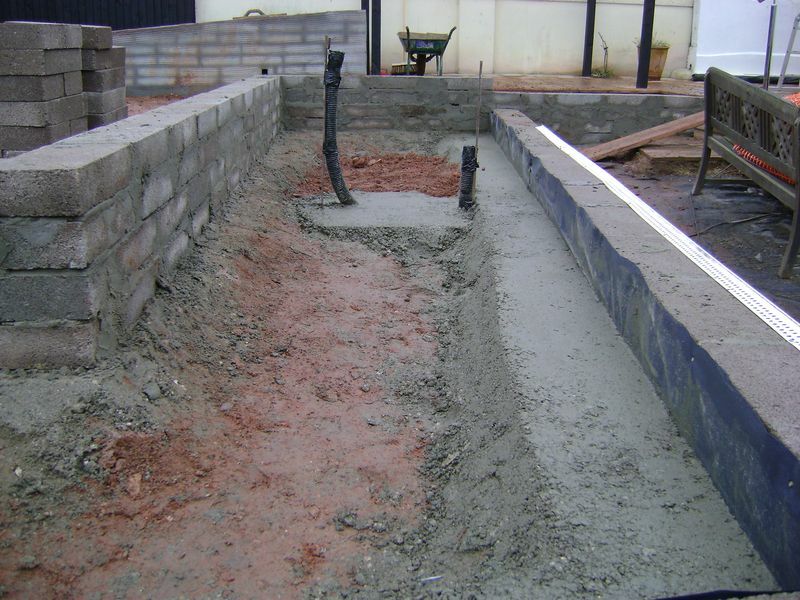 The inner walling to the internal planters have concrete mixed and barrowed to the footings, the blocks are loaded out ready for laying. Very slow today due to heavy rain and a visit to a fresh prospect, who incidentally, came and saw me on site as he thought my apology letters were extremely professional !! He viewed my website, liked what he read and saw on the website, then walked down the road to took a look at what we were creating, he’s asked for a front garden design and quote. 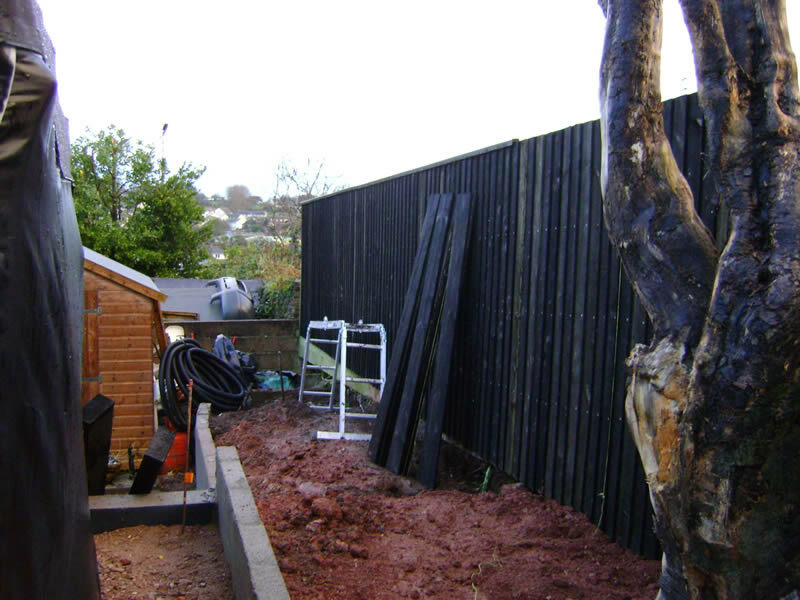 Works continue to clad and cap the existing fence, the topsoil to the planter is installed and leveled. 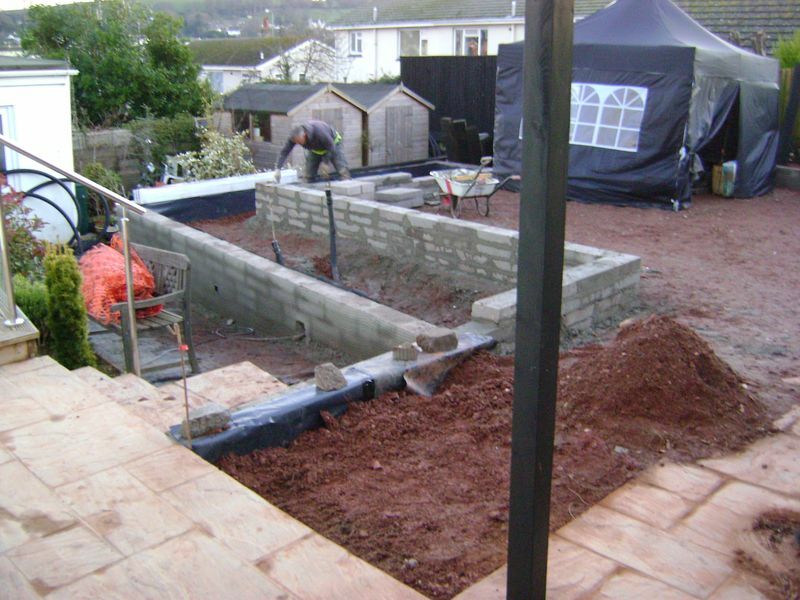 Footings are hand dug and concreted ready for the internal planter walls. 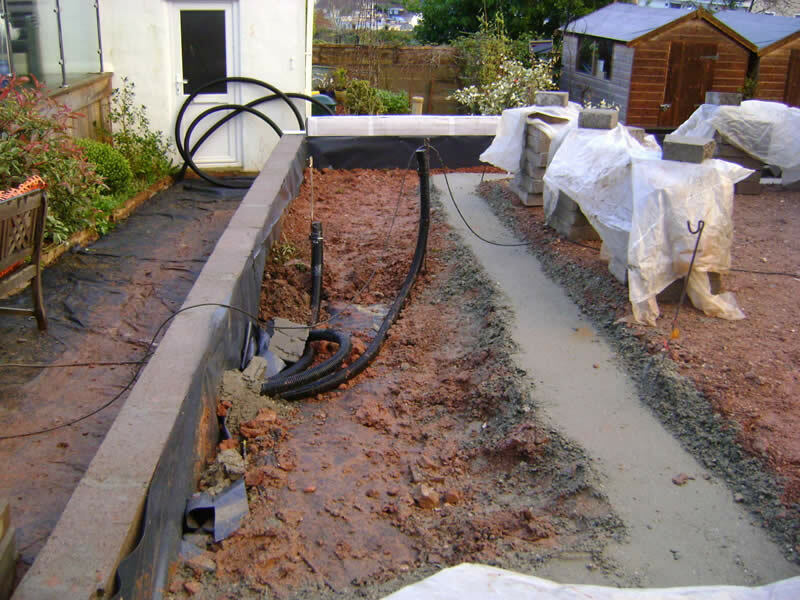 60mm diameter Electric ducting is tacked into position using concrete, the footings are topped up to the appropriate levels. 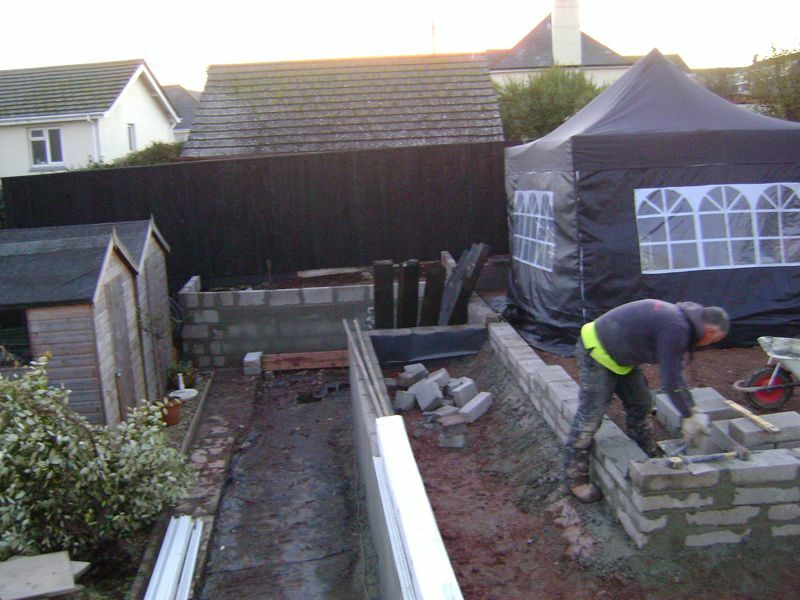 The 200x100x2400mm sleepers are painted under the pop up gazebo, left to dry and loaded out vertically. Another box of 40 white angle render beads are brought to site along with the 15mm clout nails to attach to the walling, I always use the 12mm x 2500mm long white pvc beads as you can create a smooth curve and they don’t dent if knocked against later in life. Another small section of fence is hung and given its second and final coating of black timbercare garden paint, as is the entire pergola. 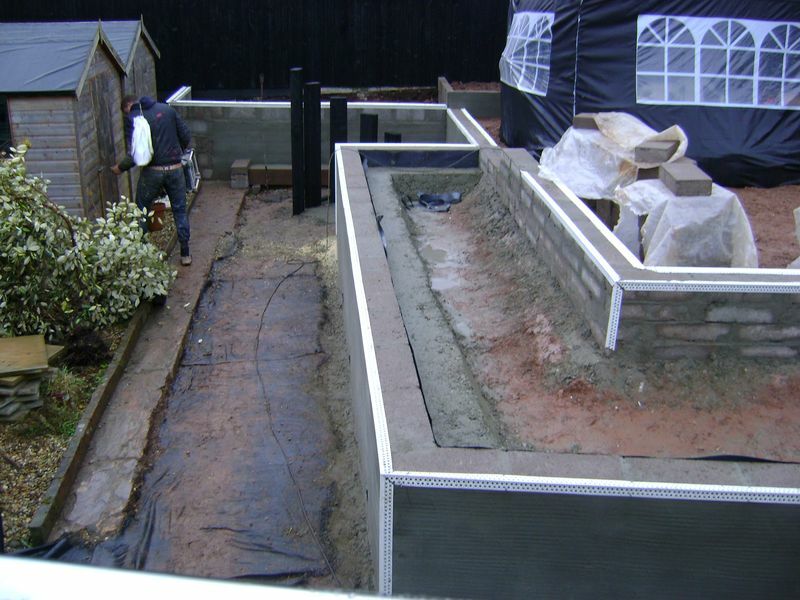 The nine inch block work is laid with a dpm liner, I’ve had to raise the height to one small section of the walling near the fence as the underside of the fence line is above the finish height of the wall and I see the planter being level, not sloping upwards to meet the bottom of the fence. All cement works are covered each evening with hessian for frost protection. Only a small amount of waste so far from 900 blocks, by the time I’ve finished all the block work there will be zero waste. A fully serviced Sthil MS 341 chainsaw and new chain makes light work of the 500mm diameter tree stump, the timber is delivered to past clients. 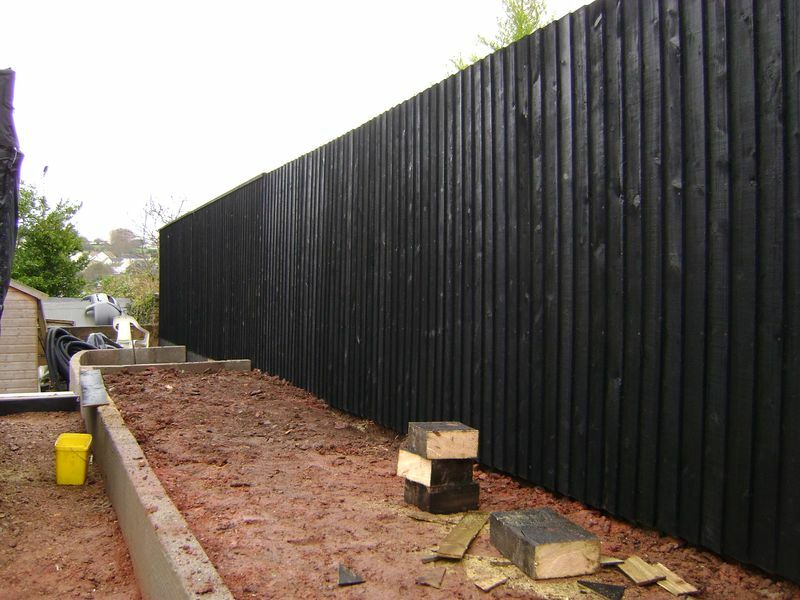 Fence cladding is now completed and the capping replaced. 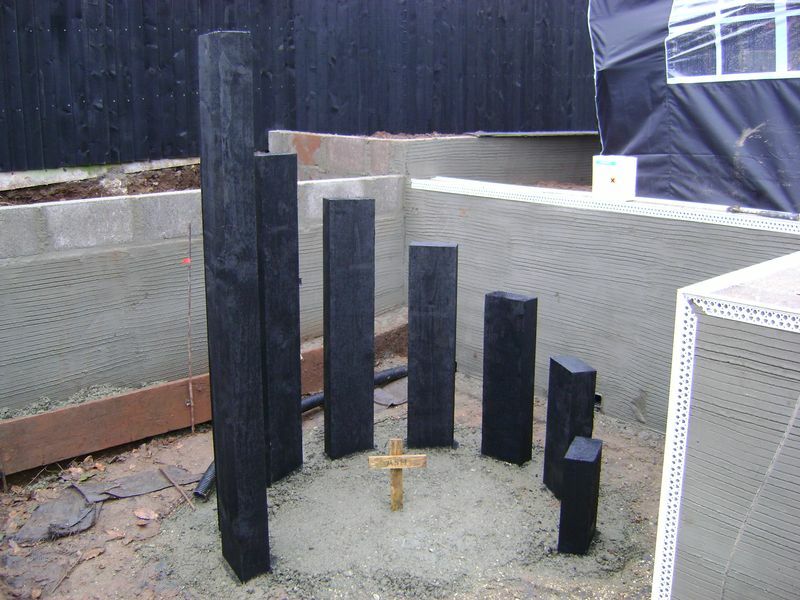 The curved sleeper “shrine” structure for Ash, the family cat, is formed, the highest sleeper stands at 1.8M high with 200mm cut off for each sleeper there on, the spacing of each sleeper is 150mm and the radius is 630mm to the face of every sleeper…..this will create a perfect circle. 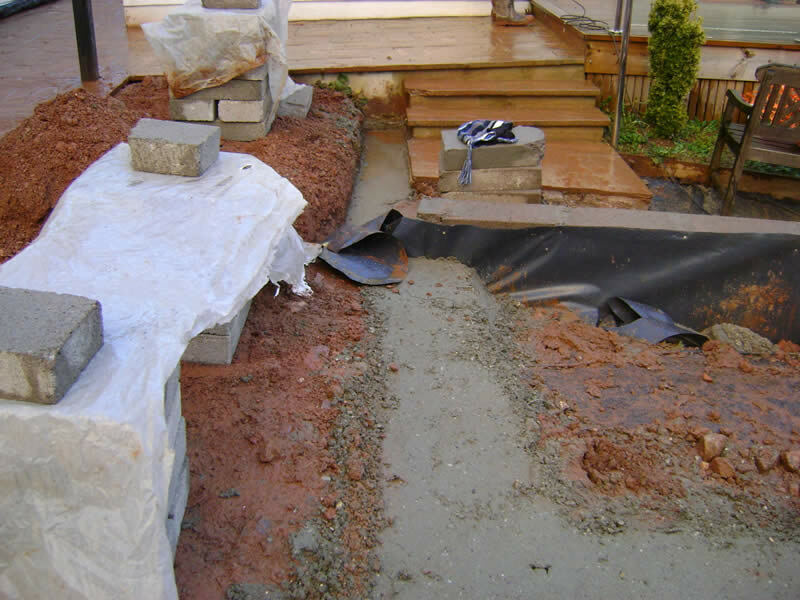 A concrete capping is installed over the grave to prevent any mishaps later in life. 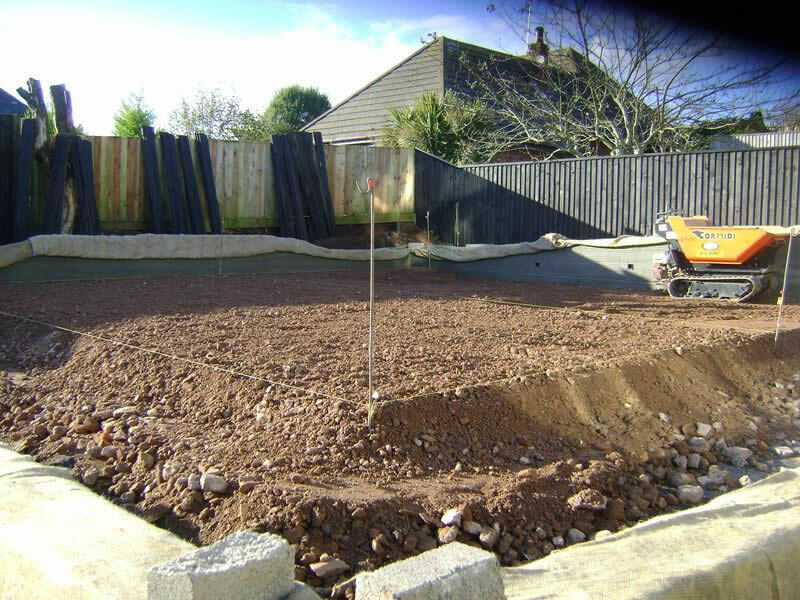 The final footings are concreted and a rotating laser level is used throughout the concreting process to ensure a perfectly level footing and therefore perfectly level block work. 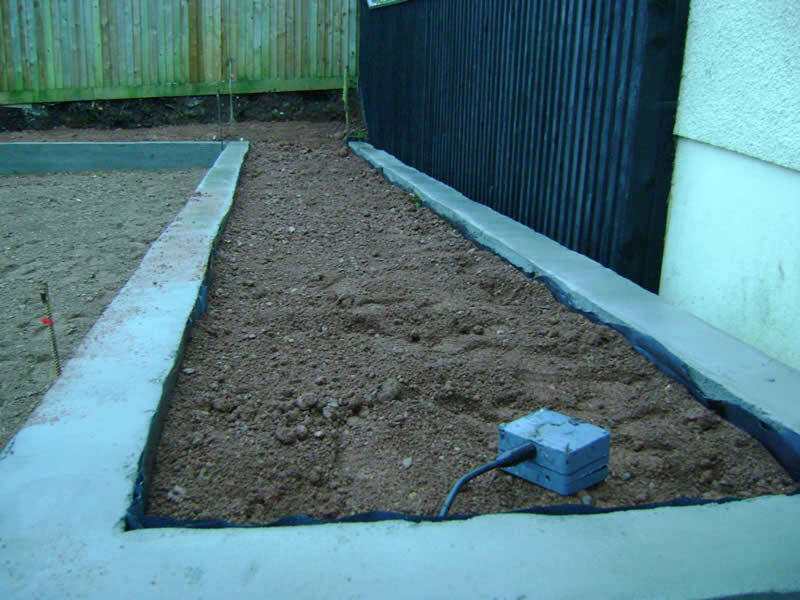 The base to the stainless steel water feature is concreted and leveled. 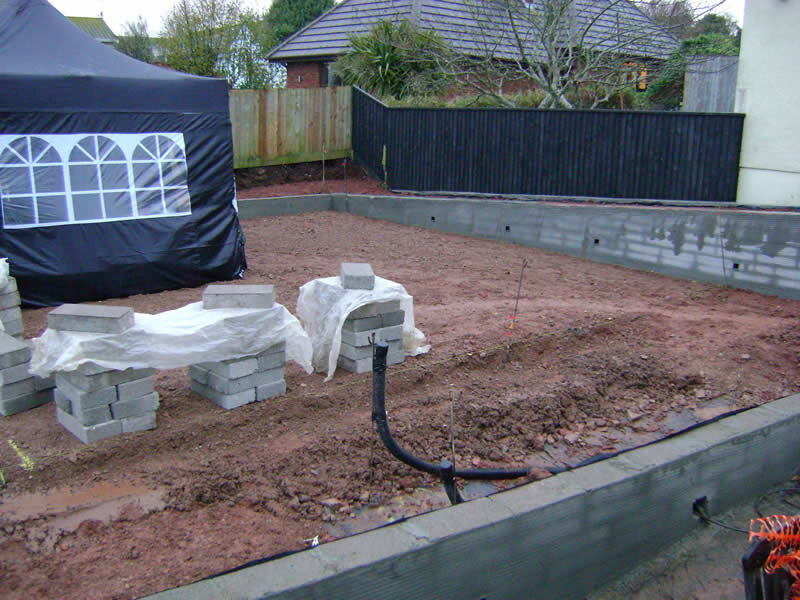 Render beads are mitered on all corners and nailed to the walling where required with clout nails, blocks are loaded out and covered to stop the rain soaking them. The existing sloping concrete plinth that stands proud of the walling in the shrine area is shuttered with a scaffold board and concreted, this will be rendered at a later date. SITE CLOSED FROM 07/12/12 – 10/12/12 DUE TO A PREBOOKED WEEKEND BREAK. 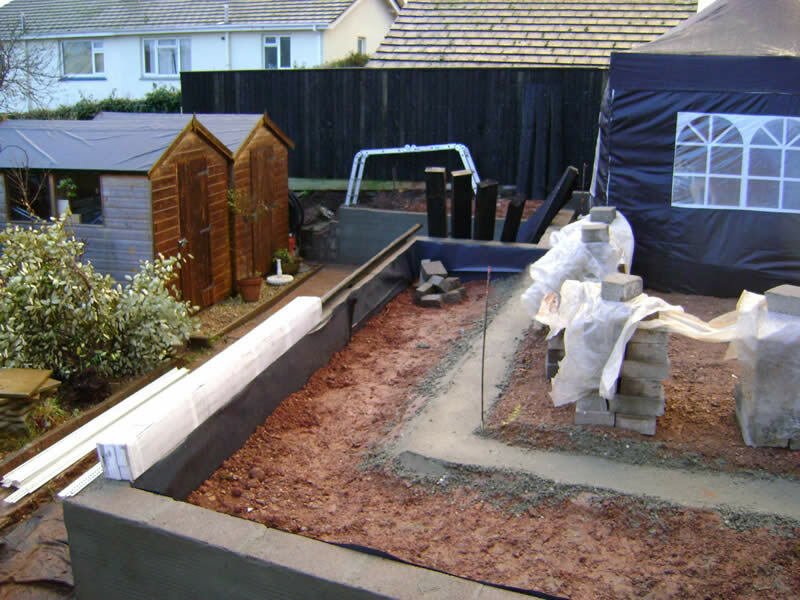 THIS PROJECT IS ON GOING, PLEASE CLICK HERE TO VIEW FURTHER PROGRESS.